Fond thoughts today for Peter Cushing who passed away August 11, in 1994. 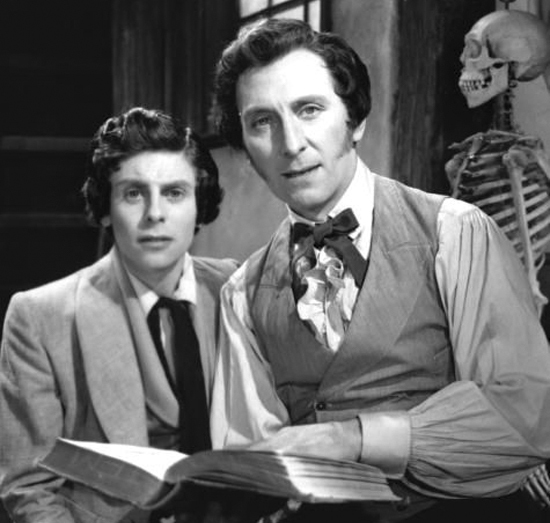 In a backstage shot from The Curse of Frankenstein (1957), “Saint Peter” poses with Melvyn Hayes, who played the younger Baron. 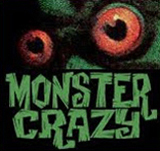 The two actors would share another credit —playing different parts — with 1960’s The Flesh and the Fiends. There was another actor who would “play” Peter Cushing, a stand-in, if you will. 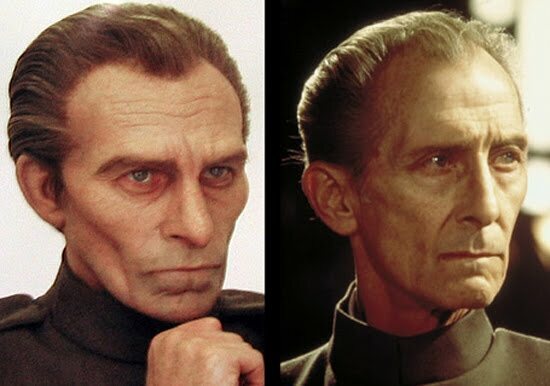 Of all his roles, and he played such remarkable characters as Baron Frankenstein, Dracula’s Van Helsing, Sherlock Holmes, Dr. Who — you name it — perhaps the best-known and certainly the most widely seen of all Cushing’s interpretations was his turn as the supremely villainous Grand Moff Tarkin, a character so profoundly nasty that he even bosses Darth Vader around, in Star Wars (1977). When George Lucas made Revenge of the Sith (2005), completing the prequel trilogy that led to the events in the original 1977 Star Wars (aka Star Wars: A New Hope), the character of Tarkin was seen very briefly with the newly minted Darth Vader and the cowled Palpatine, all gazing out a spaceship’s picture window at the dreaded Death Star under construction. Lucas considered the possibility of using outtakes of Cushing from the original film and animating his lips to new dialog, or even constructing a full digital model of Cushing but, in the end, actor Wayne Pygram was called in, his resemblance to Cushing augmented with prosthetic makeup. He is seen very briefly, and from some distance away, but it was nice to have a recognizable Cushing as Tarkin — first name Wilhuff, don’t you know — bookending the series. 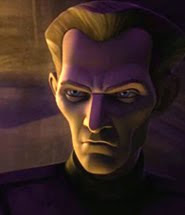 A Cushing-like Tarkin — killer cheekbones and all — also appears as an animated figure in the Clone Wars television series. Peter Cushing is not about to be forgotten anytime soon. Later this month, in the seaside town of Whitstable where he resided from 1959 onwards, Cushing will be honored — after a fashion —with the inauguration of a new pub, The Peter Cushing. 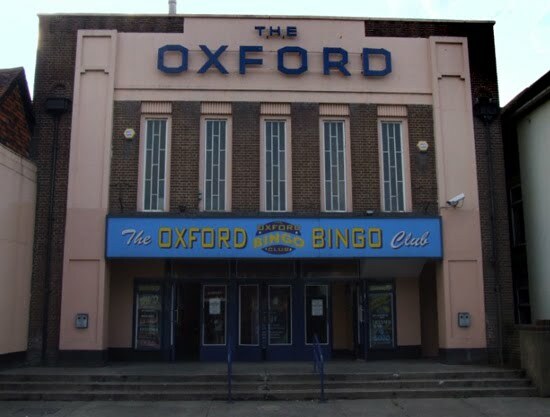 The venue is the venerable Oxford building, once — appropriately — a cinema. I wonder if it ever played a Cushing film, or if Peter and his beloved Helen attended showings there. Bingo was introduced in 1962 and took over permanently in 1984. Now, the JD Wetherspoon chain of pubs is renovating and repurposing the building. 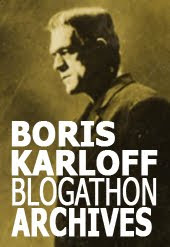 One assumes that the decor will include Cushing memorabilia, and hopes it’s as tasteful as Cushing would have liked. The Peter Cushing opens August 23. An exhaustive and entertaining biography, and tons of background info about the character of Grand Moff Tarkin on the Star Wars Wookieepedia. Photos of the Oxford building in disrepair, prior to its renovation. The JD Wetherspoon web page and Facebook page for The Peter Cushing pub. Bit of a controversy over the naming of The Peter Cushing pub, from This is Kent. My wife would kill to go to the opening of that pub. Peter Cushing remains one of her all-time favorite actors. Mine, too, come to think of it. Thanks for the reminder of a lovely man but a sad day. If I ever make it back to England, The Peter Cushing goes to the top of my must-visit list. For me Peter Cushing is every now and then Christopher Lee, Vincent Price and Herbert Lom one of the biggest actors of the past decades. The films in those these actors with worked had in contrast to the films which are thrown today on the market still style and charm! It is a pity that the film market is flooded only by mainstream and one does not reflect again for the good old time of the film.